Mattress topper or mattress protector? Which one is right for you? And what’s the difference? The quick answer is that a mattress topper (or pad) is all about adding comfort to your night’s sleep, while a mattress protector is all about protecting your mattress from spills and stains, and you from potentially allergy-inducing dust mites. A mattress pad or topper is great for adding an extra layer of cushioning to your mattress for comfort. Pads are thinner than toppers, and usually have straps or a fitted-sheet design to keep them firmly on your mattress. Mattress toppers are thicker, and can either be a layer of foam or memory foam, or they could be filled with down or other fillings like polyester puffs. When do you need one? If you’ve got an old mattress you’d like to give a new lease of life to, or a mattress that’s too firm for your liking, or you just want some extra support while sleeping, then a mattress pad or topper is the way to go. Mattress protectors do exactly what their name implies: protect your mattress. Protect-A-Bed’s mattress protectors are waterproof to protect your mattress, as well as your mattress pad or topper, from stains caused by body fluids and spilled liquids. Despite their waterproof properties, they also remain breathable, thanks to the trademarked Miracle Membrane which is impenetrable to liquid, but not to air. And since they’re tightly woven, they prevent dust mites from getting through to breed in the mattress. When do you need one? Always! Not all mattresses require a mattress topper, but all mattresses – and sleepers – deserve a mattress protector. Mattresses can’t be regularly washed like bed linen, and yet they face a daily onslaught of leaks and spills that leaves them stained, soiled, and stripped of their manufacturer’s guarantees. Did you know that the average adult sweats up to half a litre of moisture every night? All that perspiration is absorbed by the mattress, eventually leading to unsightly stains. Other common hard-to-clean stains come from childhood bedwetting and adult incontinence, and it takes just one spilled cup of coffee to leave a mattress permanently marked. These unsightly and potentially smelly stains can be easily avoided with a mattress protector. 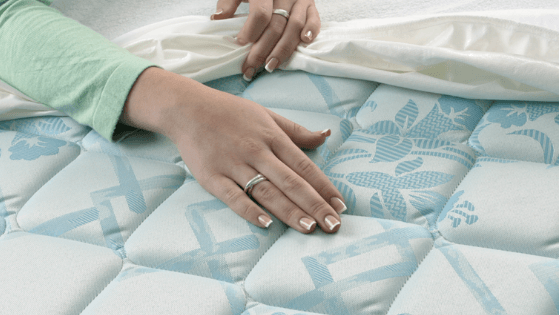 Unlike a mattress, mattress pads and toppers can be washed. That’s no reason, though, to leave them unprotected. While a thick mattress topper may keep that spilled liquid from soaking through to your mattress, you’ll still be left with a laundering headache. Protect-A-Bed’s mattress protectors are fully machine washable, making them so much easier to clean after a spill than a large, bulky, absorbent mattress pad or topper. Did you know that the average used mattress may contain as many as ten million dust mites? Over time, unprotected mattresses become clogged with dead skin cells shed during sleep, making them a breeding ground for dust mites. These tiny relatives of ticks and spiders feed off dead skin cells, producing waste that can cause reactions like rhinitis, persistent eczema, and even asthma. Protect-A-Bed’s trademarked Miracle Membrane ensures you have a restful, dry and comfortable sleep, thanks to its breathable properties which help to moderate temperature. Some mattress protectors, like Protect-A-Bed’s QuiltGuard, have a dual purpose, acting as both a protector and a mattress pad. You get extra soft cushioning, as well as a protected and hygienic mattress.